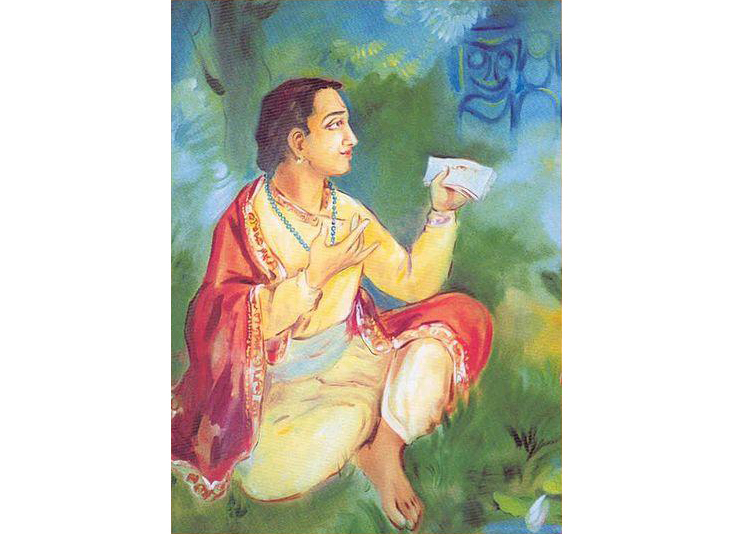 Shrila Jayadeva Goswami, the composer of the immortal Sanskrit devotional song Gita Govinda, which depicts the love story of Lord Krishna and his sweetheart Radha, is one of the most celebrated Vaishnava Hindu poets of India. Jayadeva was born in Kenduli Sasan (formerly Kendubilva), in the Prachi valley around twelfth centrury AD. Jayadeva's father was Bhojadeva and his mother's name was Bamadevi. They lived in the Birbhum district of what is now West Bengal in a village called Kenubilva Gram. Sri Jayadeva Goswami was the court pandit of Sri Lakshman Sena, the King of Bengal. Jayadeva Goswami's wife was named Sri Padmavati. Approximately three hundred years before the appearance of Sri Caitanya Mahaprabhu, Sri Jayadeva Goswami lived in Bengal. He went to Kurmapataka and gained experience in composing poetry, music and dancing. In early life, Jayadeva left home and began preaching the faith and love of Lord Krishna. He was the author of Sri Gita Govinda which discribe the Faith and Love for Lord Krishna. Besides the Gita Govinda, Jayadeva Gowsami has written another book called "Chandraloka" the famous "Dasa-Avatara-Gita", describing the ten avatars of Vishnu is from Gita-Govinda. Three hundred years before the appearance of Shri Chaitanya Mahaprabhu, Shri Jayadeva Goswami served as the court pandita of Shri Lakshmana Sena, King of Bengal. Jayadeva and Padmavati (his wife and an expert dancer) used to worship Lord Shri Krishna with single-minded devotion. After some time, he left the opulent royal life to live peacefully in a grass hut in Champahatti, Navadwipa. Here Jayadeva wrote Gita Govinda. One day while working on Gita Govinda Jayadeva felt inspired to write, "Krishna bows down to touch the lotus feet of Shrimati Radharani. " Jayadeva was hesitant to say something which might diminish Lord Krishna's position as the Supreme Personality of Godhead. He went to refresh himself with a Ganges bath before honoring Radha-Madhava's Maha-Prasadam. In his absence, Krishna Himself, disguised as Jayadeva, wrote a line in the Gita Govinda: dehi pada pallavam udaram. The Lord also accepted Prasadam from Padmavati. Opon returning, Jayadeva was astonished to see the line. Understanding the mystery, Jayadeva cried in spiritual joy and said, "Padmavati, we are most fortunate. Shri Krishna Himself has written the line, dehi pada pallavam udaram, and taken Prasadam from your hand. " Gita Govinda expresses the intense feelings of separation that Shri Radhika felt before the rasa dance. It also describes the most intimate pastimes of Radha-Shyamasundara. During Lord Chaitanya's Gambhira lila in Jagannatha Puri, He would thoroughly relish hearing the Gita Govinda sung daily by Svarupa Damodara and Mukunda. The author Jayadeva Goswami describes Gita Govinda:"Whatever is delightful in varieties of music, whatever is graceful in fine strains of poetry, and whatever is exquisite in the sweet art of Iove-Iet the happy and wise learn from the songs of Jayadeva. " After finishing Gita Govinda Jayadeva visited Vrindavana and then lived his last in Jagannatha Puri. He introduced daily reading of Gita Govinda in the Temple for the pleasure of Lord Jagannatha. His samadhi is in the 64 Samadhis Area.